Sweet side dish that will be take center stage. The crunchy topping with the creamy potatoes is perfect for your holiday meal. And it's beautiful to look at. Scrub sweet potatoes and cut in half if large. Boil in their jackets until tender. Cool potatoes; slip the peels off. Mash potatoes with eggs, milk, vanilla and melted butter. Put mixture into a lightly buttered 2-quart baking dish. 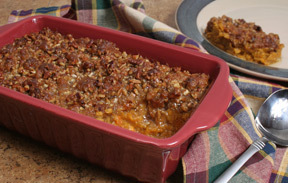 For topping, combine remaining ingredients; sprinkle over the sweet potato mixture. 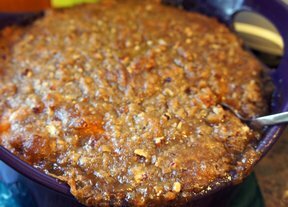 "The pecan topping is like candy on top of sweet potatoes. So tasty. This will be perfect to bring to my in-laws for Thanksgiving."